CREA, Nieuwe Achtergracht 170, Amsterdam. ISS, International Institute of Social Studies, Kortenaerkade 12, The Hague. Wijkcentrum Het Dok, Kajuit 4, Groningen. In cooperation with Groningen-Jabalya. De Klinker, Van Broeckhuysenstraat 46, Nijmegen. Dokhuis gallery, Plantage Doklaan 8, Amsterdam. MKZ, Eerste Schinkelstraat 14-16, Amsterdam. 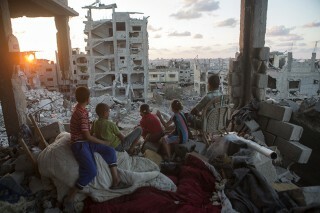 ‘One year after the Israeli military offensive on the Gaza Strip, not one home has been rebuilt. Tens of thousands of Palestinians are still displaced. 2,200 Palestinians, the vast majority of them civilians, including more than 500 children were killed. I have known Gaza since 2010. As I was the only one from my photo collective, Activestills, to be able to enter, I felt a special responsibility to document life in the Gaza Strip. In 2012, I was there when the Israeli offensive “Pillar of defence” started and I stayed to document it. I was there again in 2014, when the new large-scale Israeli assault started. Last summer I went for three weeks, to document what can only be described as a series of atrocities. In September I decided to go back, and was shocked to find the extent of the devastation. I started a photo series which became ‘This used to be my bedroom’, featuring children standing in their destroyed bedrooms, raising questions about the psychological trauma and what kind of future these generations growing up with the fear of further bombings will have. Children aged 6 years old have already experienced three military offensives. I also focus on the 142 families, who lost 3 or more members, a project called’ #ObliteratedFamilies’, to ensure not only that the victims are not forgotten, but also to highlight the plight of the survivors, and their calls for justice. Anne Paq, born 1976, is an award-winning French freelance photographer and videographer. She is a member of the Activestills photo collective, and has been based in Israel/Palestine since 2006. . Her work has been exhibited worldwide and published in various media outlets such as the NY Times Lens, Paris Match, le Nouvel Observateur, Al Jazeera, Haaretz newspaper, The National, The Huffington Post, +972 Magazine, Stern and CNN.